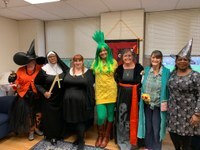 On Wednesday Oct 31, the spooky and eerie took over the staff and faculty at CJ. Costumes went from the Saintly to the strange. Fun was had by all, look at the photos and then you will agree. Go to our Flickr feed for the fun!